One of Cass’ Art projects in school last week was vegetable paint stamping. Being an arty type, she was excited naturally. I remember that this activity was one of my favorite when I was Cass’ age and I never got tired of it. Mum who was a teacher, would show my brothers and I how to carve patterns on halved potatoes for the stamping. Mum even managed to get us banana stems for the stamping. We would line our house floor with newspapers, sat on the floor for an hour or so doing vegetable stamping and were very easily contented with life way back in the early to mid 1980s. During school holidays, mum would bring us to the supermarket and each of us would be treated to a punnet of Cadbury mini chocolate thins. That was our little luxury that mum splurged on us during the holidays. Evenings were always spent outdoors playing and climbing trees after watching Scooby Doo and Flinstones. Dinner was always at 6-ish p.m. and bed time was at 9 p.m. Our lives were very structured, with no tuition during our primary school years, no computer and no mobile phones. No evil distraction from electrical gadgets. Back to Cass. A day before the art project, I showed Cass how to cut the vegetables. 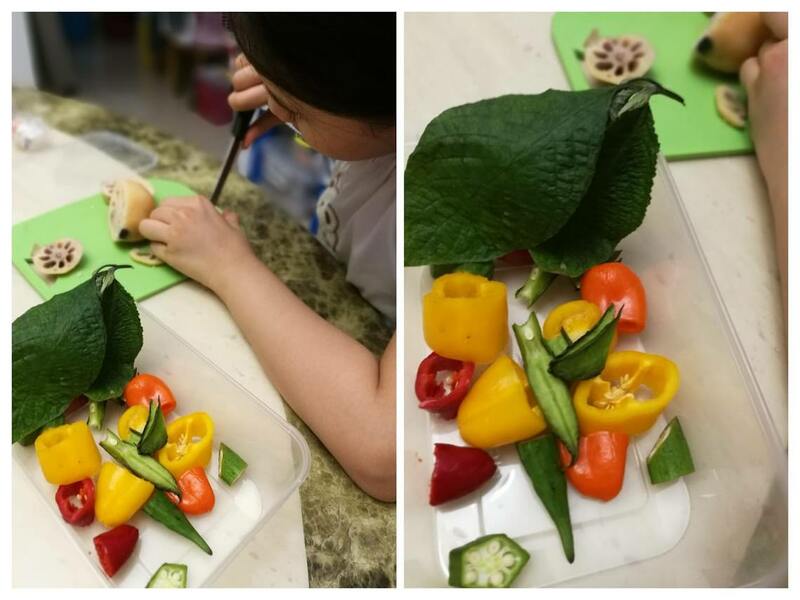 She had a great time cutting the vegetables, though she struggled with cutting the lotus root which was very hard. But when Cass returned from school, downhearted, she told me that her vegetable stamping piece was a disaster. The paint to water ratio was done incorrectly, resulting in stamps that were hideous. I felt really bad for her.